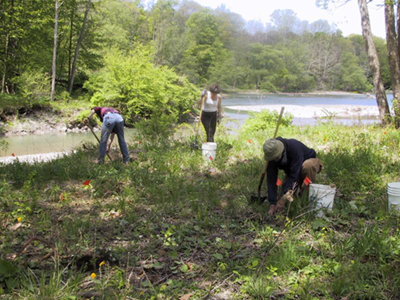 EcoLogic managed a large project team focused on developing a riparian restoration and protection plan for the upper reaches of Six Mile Creek, which is the primary drinking water supply for the City of Ithaca. The creek runs through steep areas of unstable soils, which causes active sedimentation especially during high flow events. Excess sediment makes treatment expensive and compliance with New York State standards difficult. EcoLogic staff conducted a baseline characterization of the creek, which included water quality and habitat, and streambank erosion. In addition, a full vegetation survey was conducted in six sites. A siltation pond upstream of the City of Ithaca reservoir, which is dredged every three years, was the highest priority area for restoration. EcoLogic formulated a management and revegetation plan for the siltation dam area, and oversaw its implementation as part of the requirements of this project.